Putting the phone or GPS in front of the dashboard is convenient while driving. But when you have to go for the green, switching between the handheld GPS and your club may not be a good option. You may be little skeptical about using such a small GPS device. However, do not get deceived with its size. 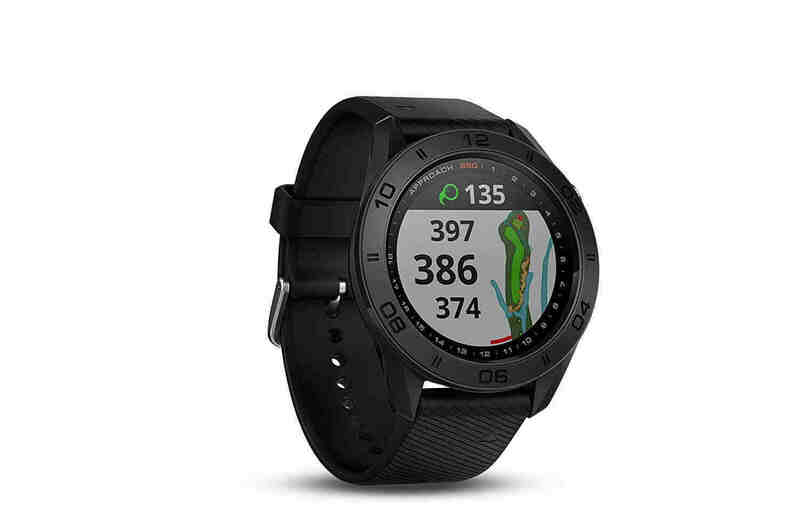 The Garmin Approach S60 GPS Watch has all the golf features in a smartwatch. According to our research, this is one of the best Golf GPS in the market. It will navigate your shots in the golf course. Moreover, it will also help you with activity tracking. So you should have one of this golf-specific smartwatch. It will tell both your score and accuracy during a game. What makes Garmin Approach S60 watch so special? The first thing you will notice is the sleek look. This shiny device itself is a bold statement about your passion for sports and fitness. The display shows everything you need. You can find all the details of the field in the large 1.2” sunlight readable display. This high-resolution touchscreen display will be your guide to get the per. The map in the watch face is vivid. It will show precise yardage to green. Moreover, you will see the hazards and doglegs in the detail map. If you drop it, do not worry. The watch comes with watch face made of Gorilla Glass 3. As a GPS watch, Garmin S60 has quick and precise location accuracy. It will show your location in the golf course within a second. Moreover, the smartwatch is a complete navigation package for almost any sports purpose. It comes with compass, gyroscope, and accelerometer. It does not mean golf GPS watches cannot be stylish. You can switch between convenient QuickFit bands for fast style changes without tools. Moreover, you can customize the watch face with any photo of your choice from your mobile by Face It app. The 1 GB memory of the Garmin watch Approach S60 can store more than 41000 preloaded courses. So you can navigate your shots almost in any golf course of the world. You can get free course updates when you access the Garmin Connect. The Garmin Connect also keep track of your game. After finishing a 36-hole day, you can track how was it. After a period of inactivity, this GPS watch will notify you with a move bar in the display. The bar will disappear after you start to move. You can play that 36-hole day without any worries. The long hours of battery life will support you throughout the match. It will work for up to 10 hours in GPS mode. But you can use it up to 10 days as a smartwatch. You can receive notifications for call text on this golf smartwatch. Moreover, you can control the music in your connected smartphone from here. After reading the Garmin Approach S60 review, none of our readers waits for even hours. They all said that despite the high price tag; it was a great investment. But, they came up with a few queries. Setting up your new Garmin S60 Golf Watch is easy. First, you will need the Garmin Connect app in your mobile device. Now create an account and sync the watch via Bluetooth. The on-screen prompt will guide you to rest of the steps. Within 10 minute, your GPS watch will be ready to go. How to pair Garmin Approach s60? This smartwatch has a builtin Bluetooth in it. It will start looking for other compatible devices after you turn on this device. Now you have to turn on the Bluetooth of the mobile phone. After a few seconds, both the watch and the phone should find each other. Hit the pair button and make your GPS watch and mobile phone Bluetooth buddies. How to view scorecards from Garmin Approach s60? You can track your score in this golf watch that comes with a scorecard view. You can access the scorecard by touching the side buttons. The new Garmin Connect software makes it a useful score tracker. You can set a guessing limit on the watch. It will help you to guess at the number of swings you took from tee to green. If you compare between Garmin approach s60 vs. S6, you will found this feature on both. It can also found in Garmin S20. Garmin has a premium multisports GPS watch fenix 5. It has all the scorecard features along with updated fairways hit. It also comes with AutoShot detection and auto measure. Except for the display size, everything is different between these two GPS Golf Watches. Garmin fenix 5 has a stainless steel finish that gives it a different look form the Approach S60. Fenix 5 has a dual navigation system. It uses both GPS and GLONASS satellite receptions. These two systems ensure precise tracking in more challenging environments. Approach S60 only use GPS signals. The 1.2” display in Garmin fēnix 5 is made of high resolution, full-color Garmin Chroma Display. The LED backlight makes this display compatible with any ambient conditions. Approach S60 has a vivid screen, but it is not consistent with all light conditions. The watch face is made of the scratch-resistant sapphire lens. So you can be worry-free if you ever dropped this premium GPS Golf watch. Garmin Approach S60 comes with Gorilla Glass 3. It can survive impact but not very tough against scratch. You can monitor your heart rate with fēnix 5. Moreover, it tells you about your steps and monitors sleep. You can also see how much calories you have burnt. Approach S60 only gives the number of burnt calories and steps. The fenix 5 can receive text, emails, and call right into your watch. However, you can only get notifications from Approach S60. This smartwatch uses both Bluetooth and WiFi to connect with other devices. On the other hand, Approach 60 only uses Bluetooth. You can use Garmin fenix 5 up to 14-days in smartwatch and up to 24-hours as GPS/HR mode. These durations are much more than the battery life of Approach S60. How to reset Garmin Approach S60? It is a pretty simple task. You have to hold the power button for 30 seconds to rest the device. Then you have to press the power button again for a second to turn on the device. Resetting the GPS watch this way will not erase any data. Garmin Approach S60 Golf GPS Watch is one of the best Golf GPS available now. Having it means convenience and confidence behind every shot. The navigation features ensure your best per. You will have a piece of mind during a game with preloaded maps. Durability and stylish flexibility make it a necessary accessory for almost any sport. It is compatible in most challenging conditions. Therefore, you can stay calm and concentrate on your next hole. Although it has a higher price tag, you can consider it as a long-term investment. This investment will bring initiatives.